Jacqueline Fortey This title in the familiar, slightly revamped Eyewitness series introduces the work of pioneering scientists, beginning with Aristotle and ending with Stephen Hawking. Women aren't entirely ignored, although only two are among the 30 inclusions, with one or two more briefly identified elsewhere in the text. The design is busy, but never seems crowded. 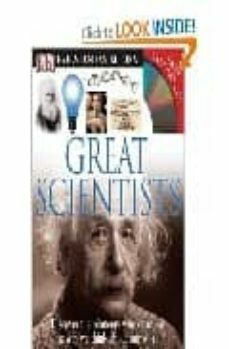 Each two-page spread features an introductory paragraph summarizing a scientist's contribution with a sentence or two of personal information, a time line, and a small picture of the individual. The remainder of the spread is a scattering of sharp photos, extensively captioned in very small type, that aim to establish the historical effect of the scientist's work. The information delivery is hit-and-miss, but Fortey opens the way to some interesting questions (what, for example, were the details of Richard Feynman's accusations against NASA after the 1986 Challenger explosion?). Unfortunately, there are no resources to help readers answer them. As far as piquing interest goes, however, the author's approach works well; it will even attract older readers. A slipcased poster and a CD of clip art are included.